Chief town of the district of the same name in Prussian Saxony, situated on the Gera. If the dates on the tombstones found in Erfurt are genuine, there existed in that city an organized Jewish community in the ninth century. The earliest official document, however, concerning the Erfurt Jews dates from the second half of the twelfth century. Between 1160 and 1186 Bishop Conrad I. drew up a form of oath to be used by them. On June 26, 1221, the community suffered great persecution at the hands of Friesland pilgrims, about twenty-six Jews (according to some sources eighty-six) being massacred. A fast-day was institutedin commemoration of this calamity. Twenty-one names of the victims have been preserved in the "Memorbuch" of Mayence, and several others are given in an elegy written on the occasion by the liturgical poet Solomon ben Abraham. Great as the catastrophe seems to have been, its effects were not lasting; and the community increased considerably in the first half of the thirteenth century. For nearly forty years the prior of St. Benedict, in whose parish many Jews resided, claimed from the Jewish owners of houses the same tithes as from Christians. When the Jews protested, the bishop decided (July 20, 1240) in favor of the prior; but the Jews, upheld doubtless by the municipal council, persisted in their refusal to pay, and the matter was finally submitted to arbitration. On Jan. 13, 1266, Archbishop Werner, in return for an annual payment of 100 silver marks and for a fee of 30 pfennigs for each interment, granted the Erfurt Jews a letter of protection, placing them under his own jurisdiction. From his notification of this arrangement to the city authorities it may be inferred that the Jews had suffered greatly at the hands of the municipality, which had been interdicted on this account. The archbishop's protection, however, did not shield the Jews from assault on their synagogues and cemetery; and the city was again put under interdict, the decree remaining in force until revoked in 1284 by Werner's successor, Heinrich of Basel, who, however, at the same time renewed the Jews' privileges. In 1291 Archbishop Gerhard II. pledged the Jews to the municipal council for 1,000 silver marks. In spite of ill treatment and numerous vexations, the Jews, as attested by contemporary chroniclers, took an active part in the defense of the city against the repeated attacks of Count Friedrich in 1309. These services, however, were soon forgotten, and the chief of the council, Hugo Longus, together with the Dominicans and certain nobles who desired to be rid of their creditors, plotted the destruction of the Jews. The plague, which had raged intermittently in Erfurt since 1315, was attributed to the poisoning of wells by the Jews, and in Aug., 1348, their quarters were stormed, about 3,000 Jews perishing by fire and sword. The council benefited to the extent of 800 silver marks in addition to all movable property remaining, but the archbishop, whose interests were injured by the extinction of the Jewish community, claimed compensation. Nevertheless, he pardoned the city in the following year, and in 1350 he empowered the council to collect and to use the debts owed to the Jews by the counts of Bleichlingen. Scarcely a year afterward a new Jewish community was formed at Erfurt, the settlers undertaking to pay the same amount of taxes as their predecessors. As the old synagogue had passed into private ownership, the council granted (1357) a certain sum for the erection of a new one. In 1373 it issued a series of ordinances concerning the Jews, who were required to wear throughout the year long gowns, boots, and hats. If capes were preferred for winter, these had to be worn over the gowns. Girdles and jewelry were prohibited. During the Christian fast-days Jews were forbidden to buy fish. The affairs of their community were to be administered by five parnasim and a rabbi. In spite of these restrictions the Jewish population of Erfurt gradually increased. It became necessary to enlarge the old cemetery, situated near the Moritz Gate, and some adjacent ground was rented (1375) from the council for an annual payment of five shillings. 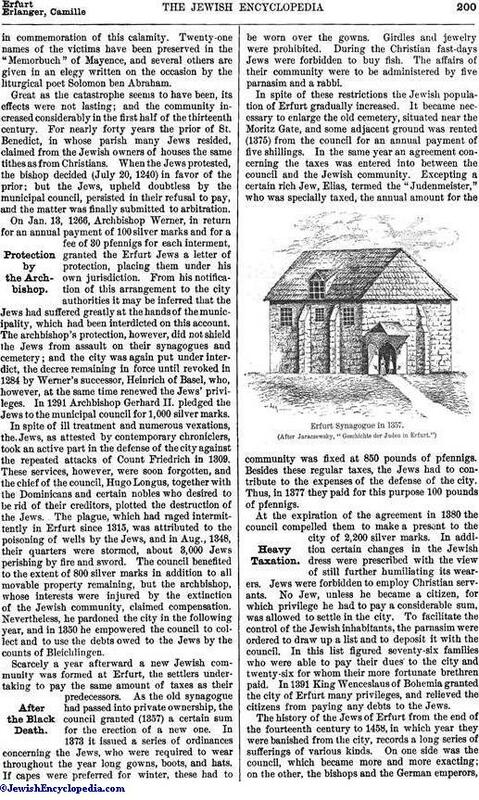 In the same year an agreement concerning the taxes was entered into between the council and the Jewish community. 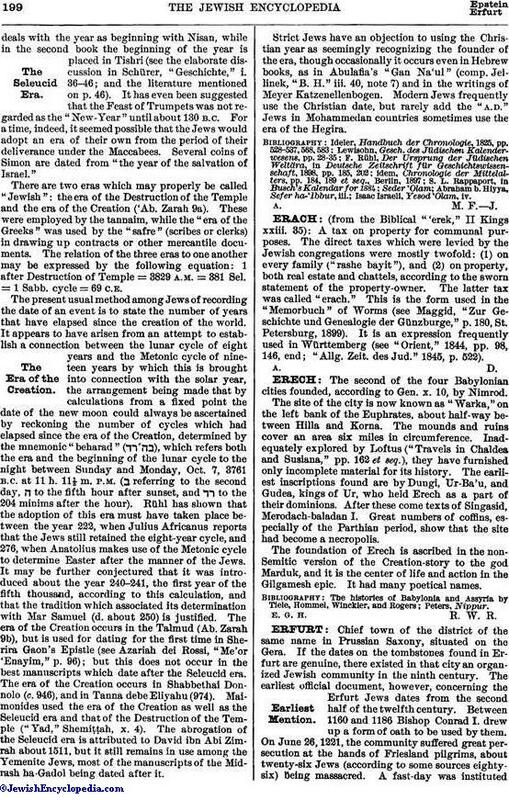 Excepting a certain rich Jew, Elias, termed the "Judemneister," who was specially taxed, the annual amount for the community was fixed at 850 pounds of pfennigs. Besides these regular taxes, the Jews had to contribute to the expenses of the defense of the city. Thus, in 1377 they paid for this purpose 100 pounds of pfennigs. (After Jaraczewsky, "Geschichte der Juden in Erfurt. ")Heavy Taxation. At the expiration of the agreement in 1380 the council compelled them to make a present to the city of 2,200 silver marks. In addition certain changes in the Jewish dress were prescribed with the view of still further humiliating its wearers. Jews were forbidden to employ Christian servants. No Jew, unless he became a citizen, for which privilege he had to pay a considerable sum, was allowed to settle in the city. To facilitate the control of the Jewish inhabitants, the parnasim were ordered to draw up a list and to deposit it with the council. In this list figured seventy-six families who were able to pay their dues to the city and twenty-six for whom their more fortunate brethren paid. In 1391 King Wenceslaus of Bohemia granted the city of Erfurt many privileges, and relieved the citizens from paying any debts to the Jews. The history of the Jews of Erfurt from the end of the fourteenth century to 1458, in which year they were banished from the city, records a long series of sufferings of various kinds. On one side was the council, which became more and more exacting; on the other, the bishops and the German emperors,to whom belonged by right one-third of the property of the Jews. Thus Sigismund in 1416 imposed upon the Jews of Erfurt the payment of 6,000 gulden, estimating this sum to be a third of the value of their possessions. In the following year he granted them a letter of protection for a period of ten years, at the expiration of which it was renewed for another term of six years; but, judging from their repeated complaints, the protection seems to have been very ineffective. In 1438 Sigismund pledged the Erfurt Jews to the knight Matthes Schlick, Burgrave of Eger, for the sum of 1,000 Rhenish gulden. In 1442 they were again compelled to pay 6,000 gulden as a coronation gift to Friedrich III. In 1454 John Capistrano visited Erfurt, and excited the mob to violence against the Jews. The latter complained to the emperor, who severely remonstrated with the council; but his remonstrances remained unheeded, and in 1450 the council succeeded in obtaining from Elector Dietrich of Mayence, in return for the payment of 450 silver marks and 4,000 gold gulden, permission to banish the Jews from the city. Until the end of the eighteenth century Erfurt remained forbidden ground to the Jews; and the heavy poll-tax imposed by the council upon Jewish travelers gave rise to many protestations. Between 1768 and 1789 only four Jews received permission to settle at Erfurt. A little later several others took up their abode there, and although the council refused them rights of citizenship, they were allowed to live in the city unmolested. Citizens' rights were first conferred on an Erfurt Jew in 1810, the recipient being Solomon Mayer, father of the mathematician Ephraim Solomon Unger. In 1811 the Jews acquired some ground near the Brühlerthor for a cemetery. 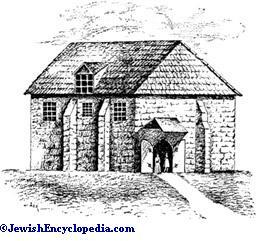 A synagogue was erected in 1840. In the Middle Ages Erfurt was a seat of learning, and possessed an important rabbinical college. In 1399 many rabbis gathered there for a synod and settled various ritual questions. Among the most renowned rabbis and scholars of Erfurt were: Eleazar of Worms, whose wife and children fell victims to the persecutions of 1221; the Masorite Eleazar ben Kalonymus; Rabbi Wadarash (?) (d. 1285); Solomon ben Menahem ha-Levi; Simḥah ben Gershon; Alexander Süsskind (13th cent. ); Isaac ha-Levi (14th cent. ); R. Anshel Cohen and R. Hillel (15th cent. ); and Jacob Weil. The community was administered by four parnasim, having at their head a chief called the "Judenmeister." Three names of such chiefs occur often in the official documents: Elias, referred to above; Heller; and Makir, whose son lived at Frankfort in 1398. Among the rabbis of the nineteenth century the most noteworthy were Adolph Jaraczewsky, Ezekiel (1879-82), J. Caro and Philip Kroner. Dr. Moritz Salzberger is the present incumbent. 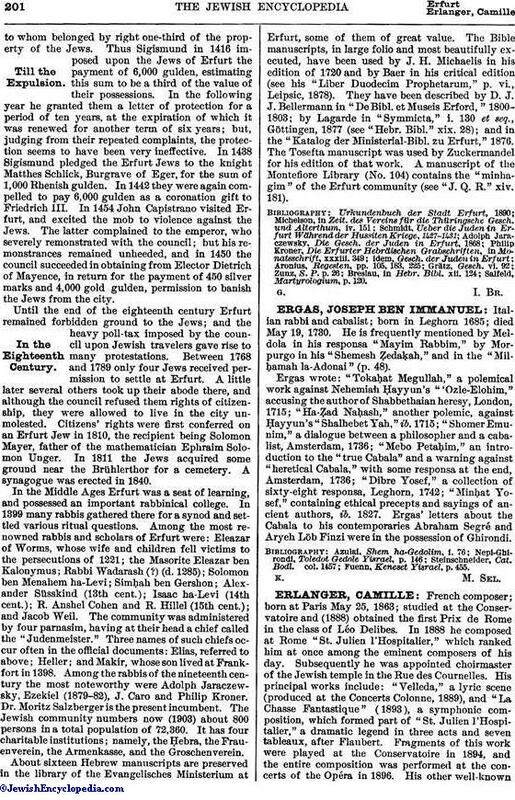 The Jewish community numbers now (1903) about 800 persons in a total population of 72,360. It has four charitable institutions; namely, the Ḥebra, the Frauenverein, the Armenkasse, and the Groschenverein. About sixteen Hebrew manuscripts are preserved in the library of the Evangelisches Ministerium at Erfurt, some of them of great value. The Bible manuscripts, in large folio and most beautifully executed, have been used by J. H. Michaelis in his edition of 1720 and by Baer in his critical edition (see his "Liber Duodecim Prophetarum," p. vi., Leipsic, 1878). They have been described by D. J. J. Bellermann in "De Bibl. et Museis Erford," 1800-1803; by Lagarde in "Symmicta," i. 130 et seq., Göttingen, 1877 (see "Hebr. Bibl." xix. 28); and in the "Katalog der Ministerial-Bibl. zu Erfurt," 1876. The Tosefta manuscript was used by Zuckermandel for his edition of that work. A manuscript of the Montefiore Library (No. 104) contains the "minhagim" of the Erfurt community (see "J. Q. R." xiv. 181).